Help Balen Andrano's failing business by sabotaging his competitor, Jeanne. Place the Dwemer's bone in the chest. Speak to Balen Andrano in the Trader shop in the Redoran Canton. Plant a Dwarven Bone close to Jeanne. Return to Balen for your reward of a Sleep Amulet. (Optional) You can get another reward if you get rid of the menace for Jeanne. Speak to Balen Andrano in the Redoran Trader shop in the Waistworks level of the Redoran Canton in Vivec. Apparently his business has been doing poorly lately, a trend that he attributes to the trader Jeanne on the Foreign Quarter Canalworks level. He asks you to plant a magic item, a Dwarven Bone, in a chest near her bed in an attempt to lower her sales. You can find the chest in Jeanne's locked back room, so the trick here is to unlock that door without Jeanne seeing you (otherwise you cannot finish the quest). You can either count on your own Sneak skill, use a helpful Chameleon spell or item, or get the key on the table in the left corner of the shop (which also requires sneaking). The chest inside is also locked but with the door closed, Jeanne will be none the wiser. Return to Balen once you've planted the bone to receive a Sleep Amulet as a reward. 10 I have heard rumor that Balen Andrano is having a rough time with his business. 15 Balen Andrano has asked me to do a job for him. He would like me to place the bone of a dead Dwemer in the shop of one of his rivals, the Redguard trader Jeanne. He claims that it will be a bad luck totem for the more prosperous merchant. 20 I have agreed to place the Dwemer bone in Jeanne's shop. Andrano tells me I must place the bone in a chest near the merchant's bed, so while she sleeps, the bone will work its evil magic. If I am spotted doing this, though, the magic will not work. 30 Finishes quest I have decided not to help Balen Andrano. 40 I have successfully placed the Dwemer bone in Jeanne's chest. 50 While trying to sneak the Dwemer bone into the chest near Jeanne's bed, I was spotted. 55 Jeanne admonished me for attempting to enter her private quarters, and threatened to call the guard if I did not stay away. 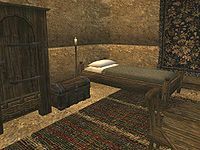 60 Finishes quest I have returned to Balen Andrano and collected my reward, a sleep amulet. 70 Finishes quest I have returned to Balen Andrano, who was very disappointed in my failure. 80 After returning to Jeanne's store, the shopkeeper tells me that she has been haunted by a dwarven ghost, and her business is suffering. She would like me to rid her of this evil spirit. 90 I have killed the dwarven spirit haunting Jeanne's store. 100 I have removed the bone from the chest in Jeanne's bedroom, and the dwarven spirit has disappeared. 110 Finishes quest Jeanne thanked me for my help, and rewarded me well for my efforts.